for our Paper Piecing Party!! Next week Friday we have our 'Lil Catz Cat Show where you can show off all your progress made with your 'Lil Catz mini quilts. 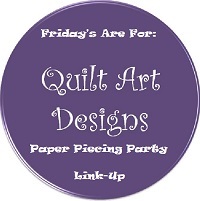 Link up your paper piecing lovelies and let's have some fun! Janeen, you are so, so creatvie! I love your own pilgrims and turkey! Adorable! Thanks,for all you do for us! How do I get the pattern for the pilgrim and turkey?